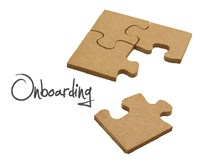 When it comes to onboarding new employees in your organization, who is responsible for what? There are typically several stakeholders who take part in the process, but sometimes those stakeholders aren’t always on the same page. In my last post, I challenged you to take action if you notice gaps. Well, here is a little ammunition to do just that – take action. Depending on your organization, this will vary. Take some time and create a list for your organization. You’ll use your list to “assign” the tasks. Determine what the new employee will need in the first 30 days. Company. The new employee needs to learn about the company she just joined. She needs to know about policies, procedures, benefits, and all the other super-fun HR stuff. She also needs to know where to locate resources to review on her own. Because even if you are a master facilitator (which I’m sure you are) and explain it impeccably well (which I’m sure you would), she still isn’t going to remember it all. It just won’t happen. Team. The new employee needs to learn about the culture, the dynamics of her own team, as well as the dynamics of teams she might work alongside frequently. Everything from team and 1:1 meeting schedules to Donut Fridays to the inside joke about the Burt Reynolds poster hanging in the boss’ office. Include the new employee so she can become immersed in the culture and feel a sense of belonging. Think of it less as “orientation” and more as “integration”. Job. The new employee needs to understand her role. The scope of her role. The expectations that come wtih the role. Current projects. Proprietary systems that she will use on a regular basis. Go-to people to ask questions or as a sounding board while she’s getting started. So, now that you’ve got the WHO and the WHAT, it’s time to match ’em up! What should HR take care of? What does the hiring manager own? What about your IT department or office manager? Every organization will have its own priorities, so I won’t even attempt to list them here. Honestly, once you know who should be involved and what needs to be done, this exercise should be quite simple. It’s so important to get all of your stakeholders involved in the onboarding process. Onboarding is no longer filling out some forms and then pushing the employee into the deep end to “sink or swim”. It’s a multi-faceted process, a crucial factor for employees to find their identity, feel valued, and chip away at the learning curve. Sound off: What does your organization do to set the stage for learning for your new employees?